Up close with Andy Grammer – Live! Starring ... You! 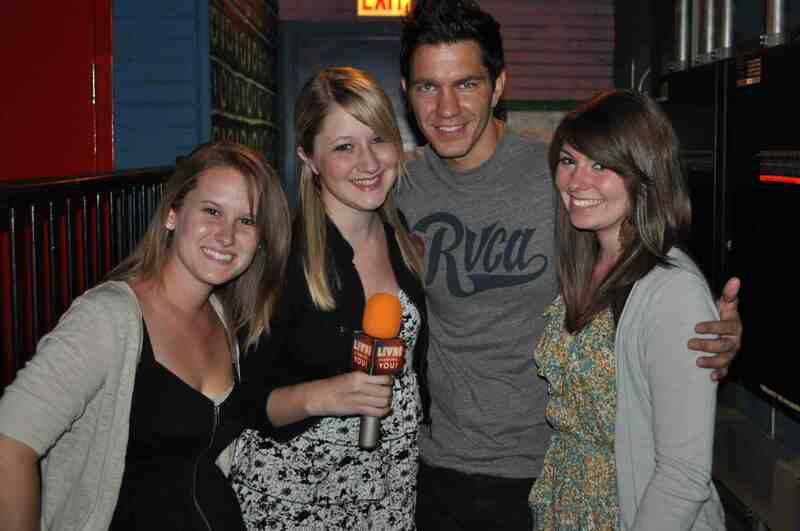 Andy Grammer in Chicago with LSY! reporters Julia Manuszewski, Erika Taylor and Lauren McDaniel. When he settled on music as his way of achieving that goal, Andy did everything in his power to make it happen. He started his “career” by playing his guitar in front of a McDonald’s on the Third Street Promenade in Santa Monica, California. Now, he’s touring the nation with top acts like Parachute, Plain White T’s, Kate Voegele, Natasha Bedingfield and, currently, Colbie Caillat. His CD is popular and his single, “Keep Your Head Up,” is a hit. The video, which features Rainn Wilson from “The Office” in a cameo, has been getting great play on VH1’s Top 20 Countdown. We chatted with Andy earlier this summer at the House of Blues in Chicago. For all of you who are trying to get somewhere in the music industry, his story is very inspiring. All you have to do is keep your head up! Lauren: What made you want to become a singer and songwriter? Andy: I always wanted to be creative and touch people through art. I tried a bunch of different avenues and landed on music as my favorite. Lauren: What advice do you have for aspiring singer/songwriters who want to broaden their audience? Andy: The most important thing starting out as a singer/songwriter is to play as much as possible. Get out of your room and let people start hearing what you’re doing. In the beginning it’s hard to get gigs, to find places to play and have ears to practice on. You’ve got to be relentless and figure out anywhere you could ever play where there would be anybody that could hear you. Lauren: How did you do that? Andy: I did that by going to the street. I performed for three years out on the Third Street Promenade in Santa Monica, Calif. I would set up my guitar case and as people walked by, I would just sing. Hopefully they would stop and buy my CD. I got to the point where I could pay my rent doing that. I was learning and getting better at the same time. It was good. Lauren: How do you deal with the obstacles of the business, especially rejection? Andy: You will have moments where you end a show, and you will feel like you want to go in your room and cry and die in darkness. You just have to kind of remember that you’re just good enough to do this, and not good enough to be a jerk about it. You have to create little parameters for yourself mentally. It’s like, “I’m just good enough to do this.” So I when I have a really crappy show, I just pull myself back into that zone. When everybody tells me I’m the next Michael Jackson, I know that’s not true, so I pull myself back in the middle. I just kind of hang in the middle. Lauren: Who do you aspire to be like? Andy: I aspire to be like anybody who has soul and heart in their music. Lauryn Hill did it really well. Her albums are incredible and she’s the coolest lady ever, but she’s also talking about stuff that’s real. That’s what I aspire to do. Erika: How do you describe your sound? Andy: The sound is three parts John Mayer, Jack Johnson, Jason Mraz; two parts One Republic and Coldplay, and then a whole bunch of parts hip hop, that I love. Erika: Which of your songs is your favorite? Andy: That’s like picking your favorite child. I can’t do that. I love them all dearly, equally. Lauren: What are the biggest conceptions people have about your life? Andy: I think the biggest misconception about being an artist – or a “rock star” – is that it just happens, that you just have talent and it occurs. This is a lot of work, a long process of developing, my songwriting, all the pieces of being an artist is a lot of work. If you think you can take this as an easy way out, that’s not a good idea. It’s as hard as going to law school, being a doctor. It takes as much work and as much focus. Erika: What’s it like performing for sold-out crowds? Andy: It’s so much fun. It’s pure joy. For a while when I was getting started, I was performing for no one – and that’s really lame. It would be like if I was talking to you, and you just didn’t say anything back. Really weird. So to be able to talk to 800 people and have them all scream back is great. Lauren: What experiences jump out to you? Andy: Someone just said a really cool quote: “If you’re too big for a small job, then you’re probably too small for a big job. “ In the beginning you’re being asked to do a lot of things like play in a room where all the TVs are on in the bar, and nobody wants to watch you. Or play outside of a subway, because they’re doing some kind of promotion and they want you to do that. You kind of just have to swallow your pride and take anything you can get. The other thing is, if you can turn around the telescope and figure out, How is this affecting people? Why would they come to my show? Are they having a good time? Are the liking the songs I’m playing? If you can turn the focus outward you can start to get somewhere and give people joy, which is the goal of it all.